The CSU Student Success Network brings together students, faculty, staff, and administrators to collaborate, experiment, and share evidence with each other in support of campus goals. We are an independent network developed by CSU faculty, staff and administrators. With financial support from the State of California, College Futures Foundation, The Kresge Foundation, and The James Irvine Foundation, the CSU Student Success Network creates spaces and provides resources for people in all levels of the CSU system in support of increasing graduation rates, equity-based inquiry and action, and closing critical opportunity and outcomes gaps. The obstacles to success in higher education are more pronounced for students from low-income backgrounds, students of color, and students who are the first in their generation to attend college—demographic groups that together represent a large proportion of CSU students and the state’s population. There are many student success efforts underway at every level in the CSU to support educational opportunities and close opportunity and outcomes gaps. As a complement to ongoing efforts, the Network offers forums for sustained, cross-campus, cross-role, evidence-based, professional learning opportunities. Through collaboration, experimentation, and the sharing of evidence, the Network strives to support meaningful connections across and within campuses that bridge professional roles and responsibilities. The Network is facilitated by the Education Insights Center (EdInsights) at Sacramento State. EdInsights is a research and policy center devoted to student success and the public benefits of education; its mission is to inform and improve policymaking and practice for K-12 education, community colleges, and public universities. What is the CSU Student Success Network? Launched in 2016, the Network hosts a slate of activities to help middle leaders develop skills to lead from where they sit. It also produces original research to help people within the system learn more about a range of issues that affect student learning, engagement, progression, and success. Participants in Network activities have access to a growing community of colleagues who share a commitment to strengthening student success. Through our activities, we create spaces for passionate middle leaders—faculty, staff, and administrators from each campus—to collaborate, experiment, and share evidence with each other. Teams come together to support system goals, like increasing four-and six-year graduation rates; closing critical opportunity gaps; and supporting equity-based inquiry and action. What are the CSU Student Success Network’s main activities? The Network supports three primary activities: the Middle Leadership Academy, Convenings and Applied Research. The Middle Leadership Academy is a year-long leadership program that empowers members to forge deeper relationships with colleagues and develop skills for making change from where they already sit. Similar to the Convenings, the Academy brings together campus-based teams in a collaborative and supportive environment to work on problems of practice. Teams meet multiple times throughout the year and are paired with a facilitator. Together, teams identify common challenges faced by students, develop a shared vision to improve practices, and communicate about what works (and what doesn’t) for students on their respective campuses. Convenings are one-day workshops built around a student success issue of importance to CSU campuses. Each workshop is hosted by a CSU campus, and is designed to stimulate conversations, build cross-campus relationships around shared problems of practice and ensure that each campus team leaves with a plan of action it developed over the course of the workshop. Every campus is invited to assemble a team of faculty, staff, administrators and students who are working on issues related to the workshop topic. There, teams will familiarize themselves with the relevant literature, share knowledge with colleagues, and explore their own campus’s student level data. Applied Research seeks to make sense of the different aspects of students’ experiences in the CSU. Network research helps develop shared language and knowledge on key topics. Findings from this and all other Network activities are shared with CSU stakeholders to help bring about mutual understanding and evidence-based change. Network activities are open to all interested faculty, staff, and administrators currently employed by a CSU campus. Student participation is welcomed and encouraged. The Network believes in the importance of a team-based approach to making change. Since most events are team-based, you should join an existing team or assemble your own team in order to participate. Many campuses have an Advisory Board member who serves as a Network liaison, you can find that list here. If you do not know who your campus liaison is, you are welcome to contact us directly at studentsuccessnetwork@edinsightscenter.org. Are there dues? / What does it cost? Participation is free for people in the CSU. Reasonable travel expenses for attending CSU Student Success Network events are covered, too. Everyone has their own reasons for participating in Network events. Some may be looking for a community of like-minded colleagues who share a passion for improving student outcomes. Others may be interested in a particular convening topic. And still others, may be looking to develop leadership skills. The Network is committed to making the experiences as meaningful as possible. The Network is facilitated by the Education Insights Center, which is housed at Sacramento State. The Network hosts activities across the state and is committed to making all events and activities accessible to every campus. All of us, whether we are in formal positions of power or not, have the ability to make positive changes. In the CSU Student Success Network we believe that “middle leaders” are an under-supported resource for making student-focused change on campus. Middle leaders in the CSU may carry the title of faculty, staff, department chair, director, dean, student, or any similar position. We interact with colleagues from across our campuses on a regular basis. We are aware of the needs of our specific CSU campus’ student populations and are excited to lead from our existing positions on campus. How do you pick topics/issues for your research and events? Topics are chosen in response to a number of factors, including campus demand, consultation with the Advisory Board, and input from the Chancellor’s Office. The Network seeks out issues that are important to a substantial percentage of campuses. If you would like to recommend a topic that you think would be relevant to other middle leaders in the CSU system, please contact us at studentsuccessnetwork@edinsightscenter.org. I want to attend the Middle Leadership Academy but I have a conflict on one of the dates. Can I send someone else? Attendance is mandatory. A commitment to participate in Network events should be treated like any other mandatory professional obligation. Public dollars support this work and must be used responsibly. Part of the success of the Academy is your professional development and growth alongside coworkers and colleagues at your and other institutions. If you know in advance that you will not be able to attend every session, we recommend that you apply again next year. Do I need to ask my Chair/Dean/Provost/Supervisor to participate? Because many Network activities require a significant commitment of time, attendees are expected to have the support and approval that they would have for any other professional development or travel obligation. Middle Leadership Academy teams are required to submit a letter of support from an appropriate administrator. In many cases, attending an event will be considered a professional learning experience, however it is important to review your campus leave policy to avoid surprises. Does the Network have an Advisory Board? The Network is guided by an Advisory Board composed of representatives from CSU campuses who serve in a variety of roles. The Advisory Board meets two times a year to provide oversight and direction for all Network activities. A current list of Advisory Board members is available here. The Network’s community of collaborators share a commitment to student success. The Network is guided by an Advisory Board composed of representatives from CSU campuses who serve in a variety of roles. The Board meets throughout the year to provide oversight and direction for all Network activities and to help identify topics for Applied Research, Convenings, and the Middle Leadership Academy. Many campuses have an Advisory Board member who serves as a Network liaison. For more information on getting involved as in Network activities, contact us: studentsuccessnetwork@edinsightscenter.org. The CSU Student Success Network complements student success efforts underway in the CSU by offering forums for sustained, cross-campus, cross-role, professional learning opportunities for “middle leaders”—faculty, staff, and administrators at the campus level who work closely with students. Student participation is welcomed and encouraged. In its second year as a state-supported effort, the Network released its first two Applied Research publications focused on issues related to students’ experiences, launched the Middle Leadership Academy which provides professional learning opportunities for cross-role campus teams, supported two Convenings hosted by individual CSU campuses on topics of importance to every campuses, engaged an external developmental evaluator, launched a blog to share evidence-based information from across the system, and continued to cultivate key relationships within the CSU. 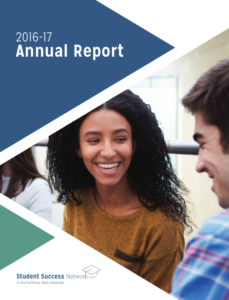 The CSU Student Success Network completed its first year of operation as a state-supported effort (in addition to funding from the The Kresge Foundation and College Futures Foundation). 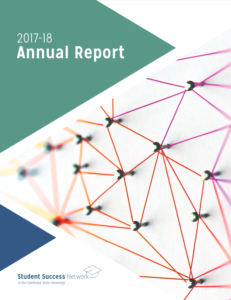 The main areas of focus for 2016-17 were to develop a sound infrastructure for the Network (such as building relationships, creating an appropriate staffing structure, and hiring an evaluator) and operationalizing each strand of work. In its first year, the Network established an operational core including an Interim Advisory Board, financial systems, and a performance management system—and cultivated key relationships systemwide. The Network also made progress across all core work strands including communications, Applied Research, Student Success Labs, and Convenings.